Rotherham United boss Steve Evans claims his team are on the wrong end of decisions because they are one of the smaller teams in the Championship. The Millers lost 2-1 at Blackburn on Tuesday and are only five points clear of the bottom three. 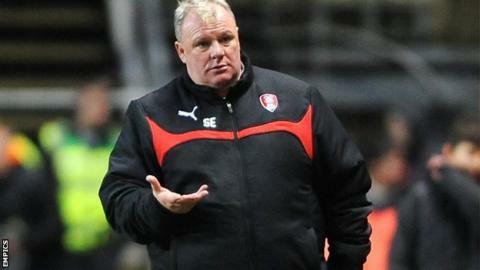 "We're Rotherham and some people at the Football League possibly don't want us in this division. "We've been on the receiving end of some atrocious decisions by officials," Evans told BBC Radio Sheffield. "People say that decisions level out and if they do then we have got a lot to get. "Gary Johnson felt it when he was up here (in this division) with Yeovil last season and the guys at Doncaster have felt it too. "There is nothing you can do about it. You just have to make sure that every goal you score has no ambiguity about it." The Millers are in the second tier for the first time since 2005 after securing back-to-back promotions. Evans felt his side should have been awarded a penalty for handball in the first half at Ewood Park, when Conor Newton's shot was blocked by Matt Kilgallon, before goals from Craig Conway and Jordan Rhodes either side of Matt Derbyshire's strike gave the hosts all three points. "I don't think there is any reason why the referee doesn't give a penalty. It was absolutely blatant," Evans said. "I thought it was a penalty at the time and I've seen it again and it is hand to ball." Harry Kane: England's next number nine? Read more on Harry Kane: England's next number nine?